Everton has now beaten the 2 teams currently leading the table. Last week's 2-1 win over Chelsea was followed by a 3-1 win over Man United. In between we beat Sporting Lisbon 2-1 in Europa. The win against Chelsea and Man U, would go some way to ease the derby defeat, a game we could have taken all points since the red-side of the City was playing with 10-man. On that matter, the Liverpool FC player sent off in that game had tackled Fellaini, and he is now out for 6 months. The tackle was vicious and we hope less of these tackles will happen. Back to the 2 wins, Everton played very well in those games, and took our chances well. 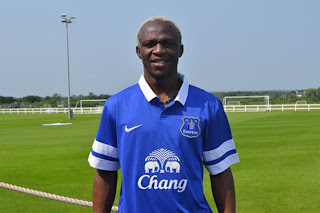 Man U look a little tired but Everton too, had to play a mid-week European game. So I suppose, on that day, we happen to hit form when Man U could not get moving. 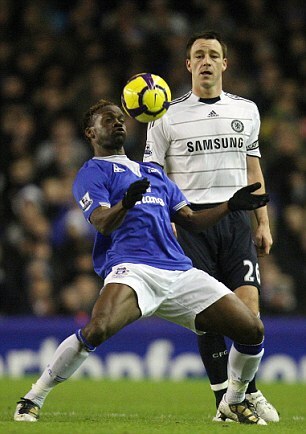 Saha scored 2 superb goals against Chelsea and we had 3 good goals on Saturday against Man U. All in all, its just 6 points that Everton needs. The win against the 2 clubs is beneficial in terms of team morale and spirit; but we are still a long way from a European spot. Everton players must not let these victories get to their head. With our defeat in FA and League Cup, we need to finish at least 5th to guarantee a spot in Europe next season. If we finish 6th or 7th, we will need the 'help' of one of the top 4 teams to win both the domestic Cups, to free up Europa league spots. We are currently 8th. Hopefully we keep our best players fit; and keep this current momentum going. Now for Spurs!